You can make a roux in the microwave. Oh yes you can! It's faster than the oven, and it's easier than the stove top. And, I'm gonna show you how!! I've got a recipe coming for you tomorrow that uses a roux, so I thought it would be a great time to introduce you to a super easy method of making a roux. Of course, I have made plenty of light to medium roux bases on the stovetop, but making a rich, dark roux on top of the stove has always been a challenge for me. It's just a downright hot process standing there and stirring and it's frankly boring, and there are more than a few times that I have burned the roux, getting impatient with how long it was taking and turning up the heat too high to try to move it along, but way more times than that, I have burned myself. Those unkind pops of oil that land on your hand are not at all pleasant! And then I discovered, thanks to my pal Alton Brown's Good Eats show, that you could easily do a very dark and flavorful roux in the oven. For me at least, that was revolutionary, I tell ya! But, even still, it took time. Precious time. Then, more recently, I heard somebody mention making roux in a microwave and of course y'all know that I was all over that! Now, I admit, the idea about combining hot oil with a microwave made me a bit leery. Oh who am I kidding... the thought of it scared me to death. Sort of like that pressure cooker thing. But I went for it and boy am I glad that I did. Now, one thing before we even get started. Just like oven cooking times vary because ovens are different, heat different and if your oven is anything like mine, it's just downright old, and isn't all too accurate anymore ... microwaves also vary in cooking times. I don't care who's recipe you use, times in recipes are always estimates, so like anything else to cook or bake, watch your roux until you do this enough to know how it will work out in your own microwave. It took me about 10 minutes to get to a roux - not counting the option of cooking the veggies in it of course - but your time may vary some, more or even less. This produces a nice, general purpose roux, and it really made a super fast and easy job of making it so I am totally sold. This is perfect for those nights you'd like to whip up a quick gumbo after work, or just generally want to speed things up a bit when you need a roux. And really, if you don't mind spending a little extra money, you can buy the roux veggies already chopped up for you in the freezer or fresh produce section of your market, saving you even more time. Proceed with caution, being mindful that you are dealing with very hot oil in this process - use oven mitts and pot holders and take extra care with handling the hot container. This is a good basic roux for gumbo or stew, and a perfect way to get a gumbo on the table fast for dinner, so definitely follow the practice of mise en place here - making sure that not only do you have everything you need for the entire gumbo or stew recipe, but also that you prep and gather it all in one place before you start - so get those veggies chopped and ready to go before you start the roux! 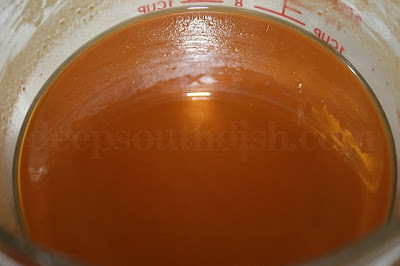 You will also want to heat up the stock and/or water that you are using as your gumbo or stew liquid. This recipe is good for about 2 gallons of gumbo liquid, more or less, depending on how thick you like it. It's also great to make ahead, cool and put up in the fridge, to have on hand anytime you need roux. Just bring the amount needed up to room temperature before using. Combine 3/4 cup of canola or vegetable oil with 1 cup of all purpose flour in a large, 4 cup Pyrex microwavable measuring dish. This will get extremely hot and I can only recommend a Pyrex brand 4 cup or larger measure that can hold up to the heat for this. Whisk together until smooth. 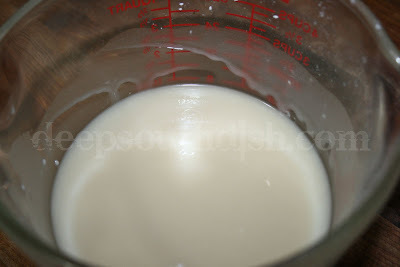 Mixture will look sort of like a thin condensed milk. Microwave on high for 3 minutes; remove and stir. Microwave another 3 to 4 minutes, stopping and stirring several times in between, continuing until it reaches a caramel color. Total time will actually be dependent on your microwave, but generally it takes about 10 minutes to get to this point. At this step you can set the roux aside to cool and then transfer it to a glass Mason jar and store it in the refrigerator. 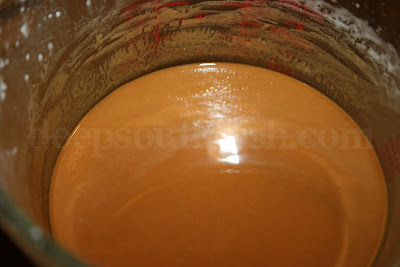 The roux will darken further as it sits. You can also freeze the cooled roux in ice trays in one tablespoon measures. Once frozen, pop them out and store in a freezer bag for anytime you need a few tablespoons of roux. Bring refrigerated stored roux up to room temperature before using. If you are going straight into making a gumbo or stew using The Trinity and/or other veggies, then move on to the next step if you would like to flavor your roux with vegetables. You'll want to have warmed stock, according to the recipe you are using. Add in chopped veggies according to the recipe you are using. Microwave on high for 2 minutes, stir and microwave for 1-2 minutes longer. 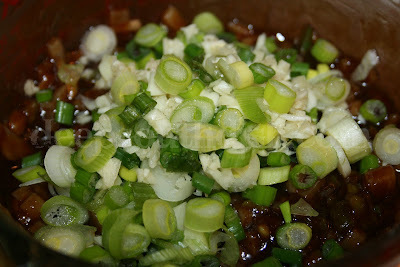 Add in chopped green onion and garlic, if using, and microwave for another 2 minutes. Stir well, then add in some of the warmed stock into the roux/veggie mixture a little at a time, combining well after each addition. Fill it up to the 4 cup measure. Slowly combine the veggie mixture with the remaining warmed stock until it reaches the desired consistency; proceed with your recipe. Cook's Note: Like ovens, all microwaves are different, so you may need to make adjustments in times according to your microwave. Better to stop and stir more times than to let it go and burn the roux! The first couple of times that you try this method, keep an eye on it and make adjustments as needed. Also, remember you are dealing with VERY hot oil - handle very carefully and use oven mitts and pot holders when handling the glass container. 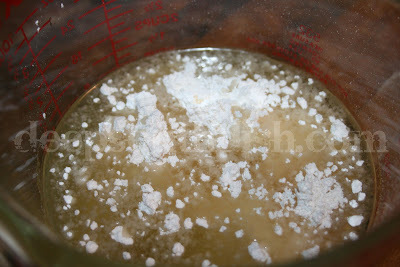 Combine the oil and flour in a large, 4 cup or larger, PYREX GLASS MEASURING CUP - or other safe, high heat glass pot. Pyrex is the only thing I know that can stand up to the heat created by this roux. Whisk together until smooth. Microwave on high for 3 minutes; remove and stir. Microwave another 3 minutes; remove and stir, continuing this process in 30 second increments until the roux reaches a caramel color, stopping and stirring several times in between. Total time will actually be dependent on your microwave, but generally it takes about 10 minutes to get to this point. At this step you can set the roux aside to cool and then transfer it to a glass Mason jar and store it covered in the refrigerator for several weeks. You can also freeze the cooled roux in ice trays in one tablespoon measures. Once frozen, pop them out and store in a freezer bag for anytime you need a few tablespoons of roux. Bring refrigerated stored roux up to room temperature before using. If you are going straight into making a gumbo or stew that is using The Trinity or other veggies, move on to the next step if you would like to flavor your roux with vegetables. Warm the stock according to the recipe you are using. Add chopped veggies to the roux mixture according to the recipe you are using and microwave on high for 2 minutes, stir and microwave for 1-2 minutes longer. 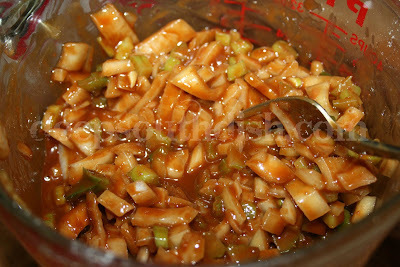 Add in chopped green onion and garlic, if using, and microwave for another 2 minutes. 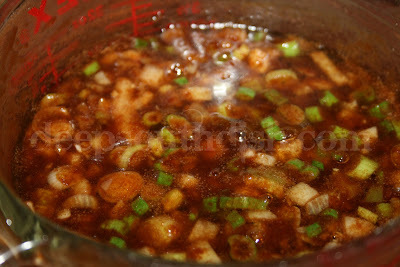 Stir well, then add in some of the warmed stock a little at a time, combining well after each addition. Slowly combine the veggie mixture with the remaining stock until it reaches the desired consistency; proceed with your recipe. Makes enough roux base for about 2 gallons of gumbo liquid, depending on how thick you like it. Ahhh, you've just made my heart sink. If I'd just waited a couple of days to make that gumbo(waiting for this post of course), I could have saved myself a ton of time. But, this post makes my heart happy too:) Because, as many roux-based meals as I make this will save me time in the future for sure!! Seriously, I'm so glad to see this post. Unless you've made roux, you just wouldn't understand! Thanks again! Thanks for a very helpful tip! I am so glad I caught this recipe. I love anything that makes a time consuming process easier to do. This one will be especially helpful. Umm, you just blew my mind. That's amazing. I will definitely use this method next time I need a simple roux. Thanks! I have to admit I was totally skeptical and doubtful about this process, but I have to say, it worked well, made an excellent flavored gumbo that tasted great, and well, is just fantastic! Who knew?? I have never heard of such a thing! Roux in a microwave! OH MY! It never occurred to me to make a roux in the microwave! I think you are a very clever gal. Thanks for sharing!!!! Oh my gosh, that has just changed everything! I usually avoid anything that has a roux because I'm a northern girl and therefore roux-ically challenged. Hi Henry! I'm so sorry for the inconvenience. Please remember, I'm just one little ole gal here, and all of those "print this" links are actually me creating separate documents and then creating manual links. I actually only recently started doing that, but I haven't gone back to edit every single old post yet, just as I run across them. Guess I haven't gotten back to the roux posts yet, but you'll probably run across a few others too I haven't caught up with yet. The easiest way to print when you run across older posts that I have not gone back to yet, is just to do a highlight, copy and paste into a word processing program. Hope that helps! I've been doing microwave roux for like forever!. I don't have a big pyrex measuring cup, but I have a glass pyrex roasting pan--so it's shallow but a lot wider than the measuring cup. Do you think this would work? Hmmm... to be honest I have only ever used my Pyrex measuring cup for this one. The mixture gets blazing hot in the microwave just like a roux on the stove does and I'd really hate for you to crack or break that roasting pan for sure, so I wouldn't recommend it be done in anything except the Pyrex. I just honestly haven't tried any other containers to attest to it. Having spent many hours stirring roux for gumbos, and getting so mad if they did scorch, I was looking for a new way to do this. I was very skeptical when I read this post but thought I'd give it a try. I've been converted. This turned out better than any roux I've made on the stovetop. I stopped it every 2 minutes to stir it and check the doneness and it took about 12 minutes total. This is going to be my go-to roux making method from now on. THANKS!!!! Crazy isn't it? The only thing that scares me is the container bursting in the microwave, but so far that hasn't happened with the Pyrex thankfully! I'm curious why this microwave roux recipe calls for a 3:4 ratio of oil to flour, but your oven recipe uses a 1:1 ratio. We're talking two different methods. One is for a very dark roux that cooks for a much longer period of time where I find the 1 to 1 to work the best. You can use a 1:1 here too if you prefer and I tried that myself, but since we're doing a quicker and lighter roux, I found that using slightly lesser amount of oil to flour for this smaller batch version to work best for me in the microwave. Your mileage may vary. excellent results... i've made several gumbos with this roux, and it's really exactly that easy, and that good. It sure is convenient isn't it? Thanks for the comment Michael! Well so justin wilson doesn't haunt me as he was so against microwave or oven roux I start it like this in the microwave and finish it in a deep pot for another 5-10 mins to dark chocolate color where I'm making the gumbo - cuts the start up time considerable and isn't a total violation of the law! I've not had that foaming up experience with the 4 cup in my microwave, so your microwave may be more powerful, but yes, what the intent was is to use at least a 4 cup Pyrex or larger. Does this roux pop out in the microwave like most things you put in there uncovered ? Should i put a paper towel over it while it cooks ? Hi Kwyla! I use an 8-cup Pyrex glass measuring bowl and I do not cover it, and have never had any popping, but remember you are stopping it and stirring it first after a few minutes, then after a few seconds- microwave, stop, stir, microwave, etc. Be careful, this stuff is like lava so I definitely recommend an oven glove too! I cannot express how much I love this recipe. It's the only roux I make. Like most people, I super duper value cooking, but have very little time to do it in!! I'm so glad that you tried it! Roux can be pretty time consuming to make on the top of the stove. I won't say that this is exactly the same as that, but it's close enough for me when I'm rushed for time!